In all my years of obsessing over glitter, I have not yet seen such a gorgeous and unique blend like Peacock Squawk . 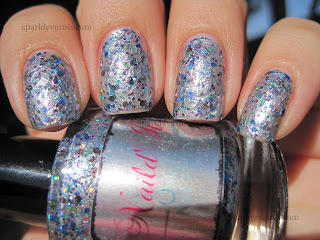 This perfect two-coater is packed with glitter, just the way I like it, in a blue-toned shimmery silver base. 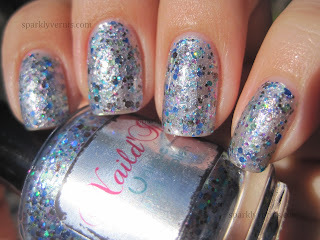 When Llarowe sent me a few Naild'It nail polishes for review, I already knew it was going to be awesome, since one of my favorite indie nail polishes, Dragon Scales, is made by Naild'It. These will be restocked today at 1:00pm MDT and 7:00pm MDT right here. I highly recommend that you either sign up for updates or follow Llarowe on Facebook, if you want to get your hands on these babies and other indie goodies. I haven't had time to post the others yet, but I can tell you that Naild'It Halloween collection is going to be a really good one. Back to Peacock Squawk, this looks a bit 3D in some lights, I confirmed this with a couple of friends I showed it to (IRL not in pics), however it is stunning and a must have to add to your collection if you are a glitter lover.